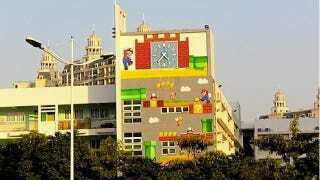 In the city of Shenzhen, a Super Mario Bros. mural was recently added to the side of an elementary school. Flickr user DCMaster first spotted the mural, which appears to be more than just a painting. If you look closely, you'll see how the characters actually appear in relief. And as one Kotaku reader pointed out, if you look even closer, Luigi is wearing Mario clothes. Japanese site NariNari recently had its correspondent check the mural out. You can see photos below. The five story building can be seen from the distance. So can the Mario mural. The mural apparently went up in October. But why Mario? NariNari reports that this elementary school is putting considerable effort in manga and anime education (yes, yes, Super Mario is a video game). Supposedly, the mural gives children something to aspire to and also helps reduce any fears about attending school. The mural doesn't appear to be sanctioned by Nintendo. NariNari reports the mural is both quite popular, with passersby saying they love Mario and how cute the image is.